I know you are probably wondering what minimalism, lagom and hoarding have in common – most would say that minimalism and hoarding are the complete opposites but I believe they have a lot in common. Does stuff or the lack of stuff make people happy? I imagine many would say yes. I believe that with either it’s always about one more thing. One more thing to acquire or one more thing to purge. it never seems to be enough. walking through the stores thinking will this item make me happy? walking through the house thinking will this item need to leave my house? Either way it’s about that strong urge to focus on stuff (or the lack thereof). Lagom however is this wonderful Swedish word that roughly translates to just the right amount. Hoarding can be too much stuff. Minimalism can be too little stuff but Lagom is just the right amount. If 100 items is just the right amount for you to where you don’t feel deprived and you don’t feel overwhelmed then that’s your number or those are your things that you need. If 5,000 items is just right for you to fit your needs (a crafter maybe? with a large family) then that’s your number. However it’s not about the number at all it’s more about having what you need no more no less. For each person this is different. So with Lagom it is okay to buy new things, it’s okay to own things and it’s okay to be at peace with things as long as it’s the right things for you. Be happy with embracing enough, embracing equality and sharing of resources by donating items that no longer fit you and your lifestyle, resist the call for too much or too little. I’ve decided that instead of trying to reach for this unattainable goal of living a minimalist life with my unwilling husband and daughter that I should strive for a Lagom life and be confident that if we keep what we love, enjoy and use that our home will be comfortable and happy. I will admit that as I’ve been purging and decluttering that I am happier but is it about giving up the stuff or is it a combination of everything I’ve been going through. I still think too much about stuff and I’m not okay with that. I still feel the strong urge to acquire and have actually bought more since starting on this process. I still feel the strong urge to declutter and get rid of stuff. Now don’t get me wrong, the number of my items in my home have been steadily decreasing but some of the quality has been increasing. quality involves more money put into the item. We got rid of hundreds of items with our last yard sale. so we rushed off to the store and bought a keurig. we love it and my husband uses it daily. so definitely a good purchase. the kcups are expensive and although we have a reusable filter my husband prefers the cups. reoccurring “luxury” costs. still takes up less room than all the other stuff. this awesome coffee machine creates the urges to buy MORE! Now that we have this lovely machine sitting on our counter I want to buy a lovely display rack to store the cute little cups in. We haven’t bought it but I want it. Hate the wanting. I want to not want. The kitchen has less stuff in it but it still gets messy so fast. I buy food that we don’t really need because I have a food obsession and often feel deprived based on the trauma of my past. We have less dishes but still hate to wash the ones we have. We have less bakeware – this one is hard for me as I want to buy more. We don’t need more than 1 cookie sheet or 1 cupcake pan or more cookware than we have but I WANT it. I am really trying to justify buying a few loaf pans but I don’t really need them. When I was at my mom’s house I baked three delicious little loaves of bread so now I want them to bake bread at home but in reality I always have frozen bread dough but rarely do I ever make loaves of bread with it. I use it to make rolls, or pizza, or pull apart bread or any number of things but very rarely would I make loaves of bread. One recent purchase that I absolutely love is my rice cooker/ food steamer. I use it frequently, it’s super easy to use and to clean and it makes more than just rice. I made quinoa today and it turned out perfectly. We got rid of lots in my daughter’s room but spent money upgrading her things. We got rid of her rather large toy box and replaced it with this rather cute set of drawers which holds considerably less toys. She is amazed at how much more room she has to play in her room. She is spending more time playing now that she has less stuff! The toy box she purged was one of those long outdoors storage benches made out of plastic – they hold a lot of stuff. She is ready to get rid of it completely but I’m not. We put it outside next to the shed and I put her roller skates, moon shoes and the fishing poles and tackle box in here. Better than them being all scattered about. She wasn’t ready to part with most of her toys though so I bought a large tote to store these toys in the shed until she is ready to part with them. 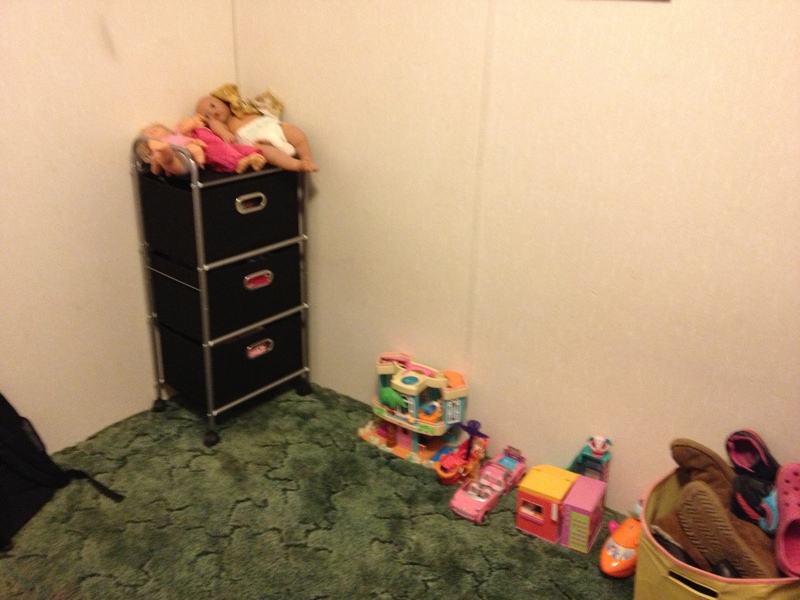 She was able to choose what toys went into the bins for her room and what toys went into storage. One thing she purged from her living room was her bed frame. strange – and sometimes i worry what people would think of my daughter’s mattresses being on the floor but she is happy with it and it makes her room look bigger. I like it because nothing disappears under her bed anymore. I also like it because we are not banging into the metal frame anymore. (the polly pocket toys all fit in a bin so when her room is picked up the only toys you see are the three babies on top and the stuffed animals in her net.) so her room bit by bit is getting to where it needs to be. We’ve gotten through quite a bit of our kitchen. 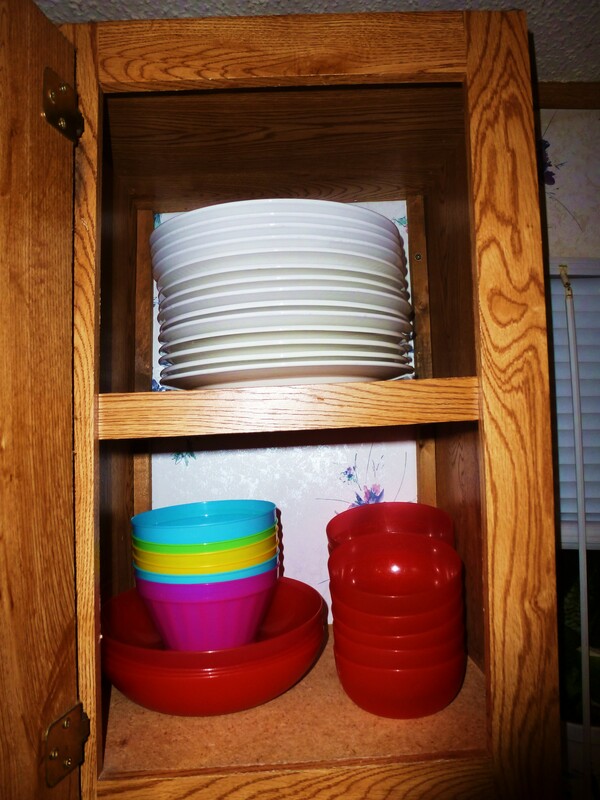 We downsized our drinkware to a small cabinet, downsized our plates and bowls into another small cabinet. 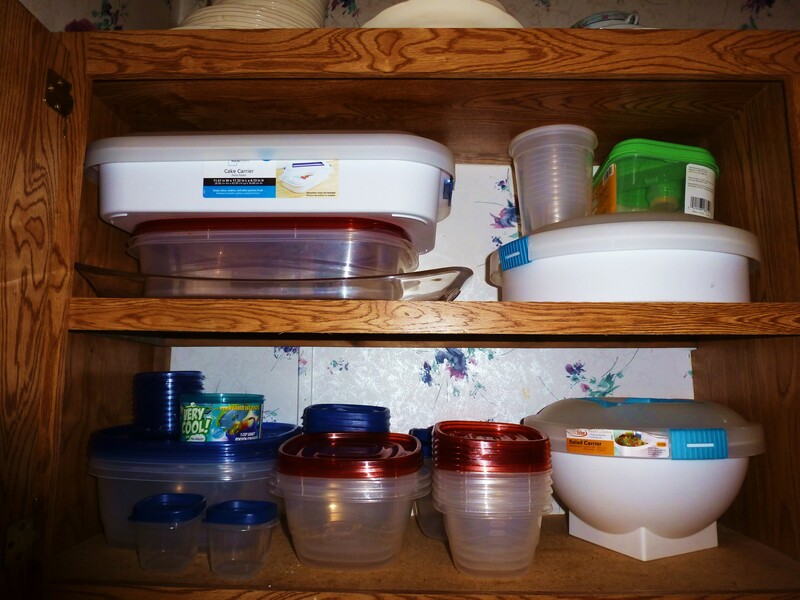 I removed our storage containers from three different locations and placed them all in the larger cabinet. I pulled some pyrex to sell in the yard sale. Here is our newly purged drinkware cabinet. We did decide to get rid of our stemware and all of our glasses. This is really hard for me but truth be told I have been accidently breaking these glasses left and right. I on the other hand really LOVE my brightly colored plastic cups. My daughter loves her cups with the lid and straws. 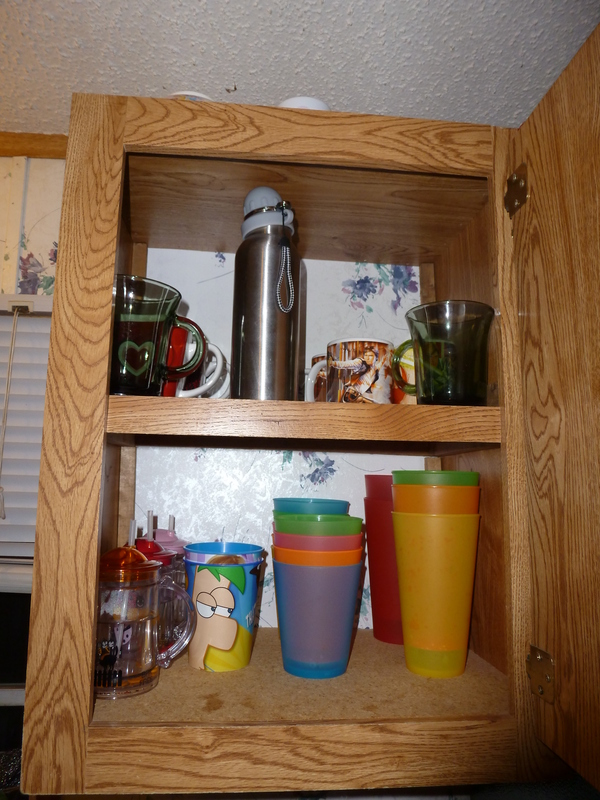 We dropped down to 8 mugs – husband won’t budge below since we make coffee when family visits. Our two wonderful fly lady water bottles have enough space now to rest easy in the cabinet. Before the purging the bottom shelf with glasses, the top shelf was coffee mugs stacked two high. 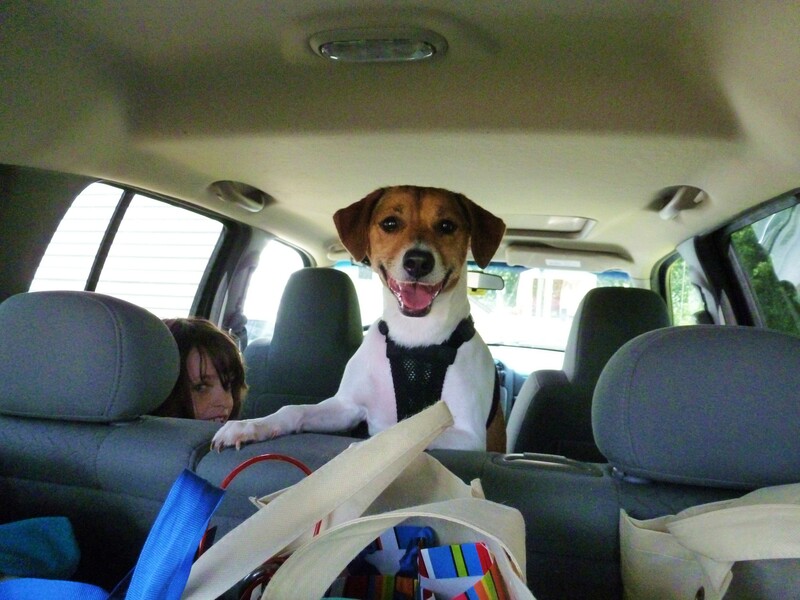 There were three surprising things we are putting out into the yard sale. The first two are our toasting glasses from our wedding. 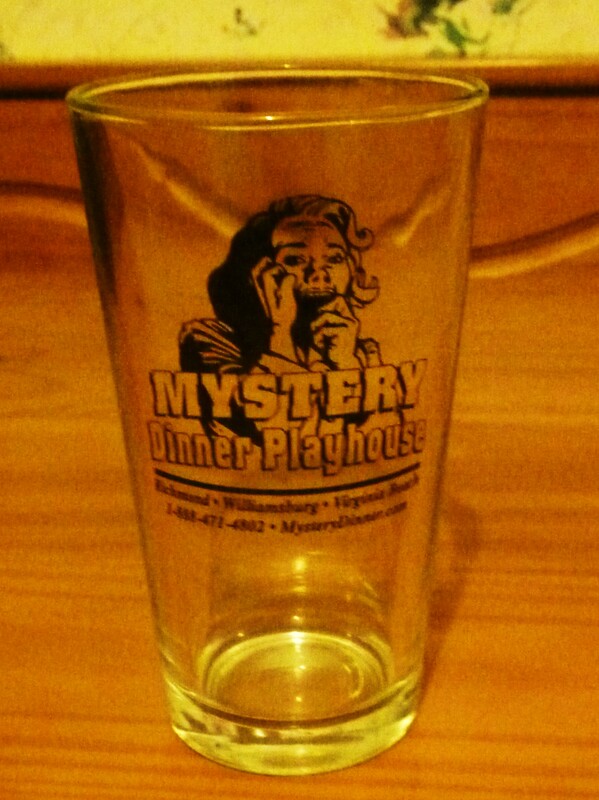 and the third is our souvenier glass from our honeymoon. While we were in Williamsburg we went to two different dinner theaters – Rosie Rumps Regele Dump and then the Mystery Dinner Playhouse. I loved them both and will remember them with or without this glass. We were able to downsize our dishes. We had this lovely white set for as long as we’ve been married. I really do like the set but since we moved into this home we barely use the small plates or the bowls. We prefer the plastic bowls. The dinner plates however we definately use. Here is the newly purged cabinets – the contents requiring 1/2 the space needed before. I got rid of any without the lids, that were stained or were missing pieces. I had this lovely lunch box styled set that had an icepack built in but i lost one of the inner containers so we placed it in the yard sale pile. I really do have more than I need but I use many of them for homemade play dough to use with my kids at work. Pictured below is our yard sale pile – the items we purged today. The tote is full of the drinkware plus some extras. I went through our spices while my husband is in bed. We’ve purged our cabinet with our pantry items pulling out enough to fill one of our reusable grocery bags. 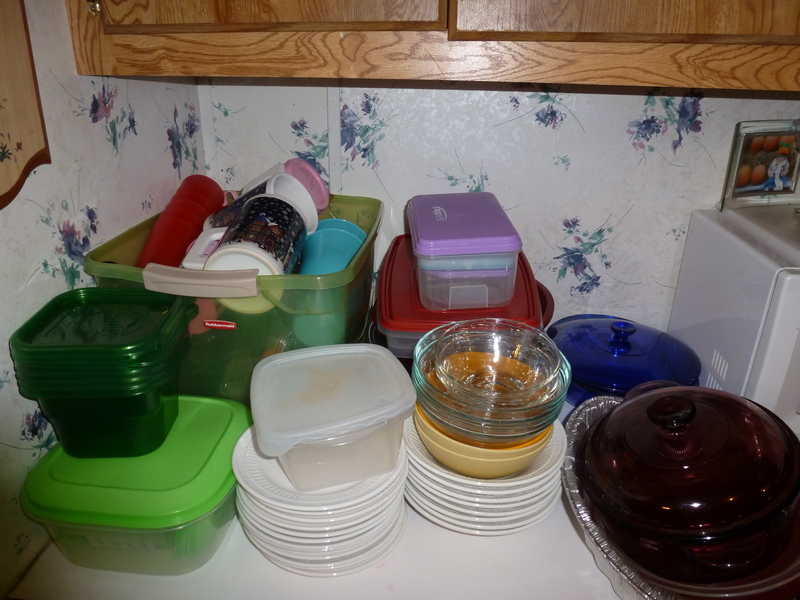 I’ve pulled all of our seasonal dishes down from ontop of the cabinet and washed them so we can go through them in the morning – I have my eyes on a few that will be leaving the house come yard sale day. In the kitchen all the really remains is the china set that my husband thinks he is ready to part with. I intend to keep a few pieces from it as they were his grandmother’s. My thoughts are a few are better than all or none. so we are going through our kitchen cabinets – first things first I had to wash all of our dishes so that we could see the whole picture. We started with the drinkware – i pulled all the water bottles, glasses, coffee mugs and cups down and arranged them all on the table. 10 coffee mugs for a family of two adults. 4 wine glasses that we rarely ever use. 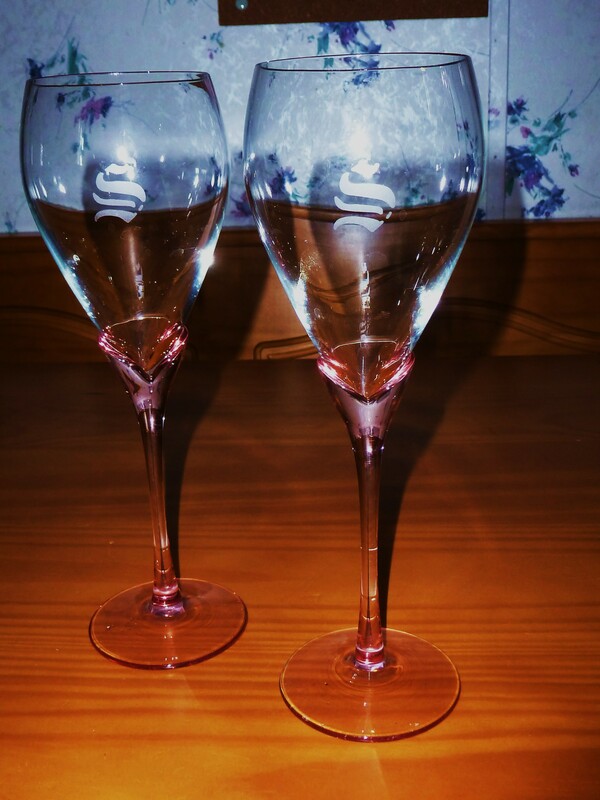 12 glasses that we don’t use. well over 20 plastic cups. We purged down to a much more reasonable number and freed up tons of cabinet space. All in all we cut down by over half. Next was the plates and bowls. We kept all 12 of our glass dinner plates but got rid of all of our small glass plates and our glass bowls. We kept our lovely red plate bowls, our red bowls and mini bowls and a new set of plastic bowls. the rubbermaid is arranged on the table waiting for my husband to help me narrow down but it’s break time – an episode of Deep Space Nine then more purging. more to go but definately making progress.